NETWORK FINALS: NBC’s NHL PLAYOFFS game adjusted to 1.0 in final numbers. CABLE HIGHLIGHTS: It was another winning night for Adult Swim’s late-night line-up, which performed as follows: SAMURAI JACK up 0.02 to 0.63, DRAGON BALL Z up 0.13 to 0.53 (the primetime episode was up 0.04 to 0.33), ATTACK ON TITAN up a tenth to 0.45, TOKYO GHOUL up 0.07 to 0.40, HUNTER X HUNTER up 0.09 to 0.39/755K, MOBILE SUIT GUNDAM steady at 0.26, NARUTO up 0.01 to 0.26/539K, and GHOST IN THE SHELL up 0.01 to 0.24/509K. (HBO, as its practice, counted the theatrical movie JASON BOURNE as an “original,” and it was at 0.52.) FX’s UFC PRELIMS was at 0.50. Fox Sports 1’s NASCAR race was at 0.48. Univision’s LIGA soccer matches were at 0.33/0.25. 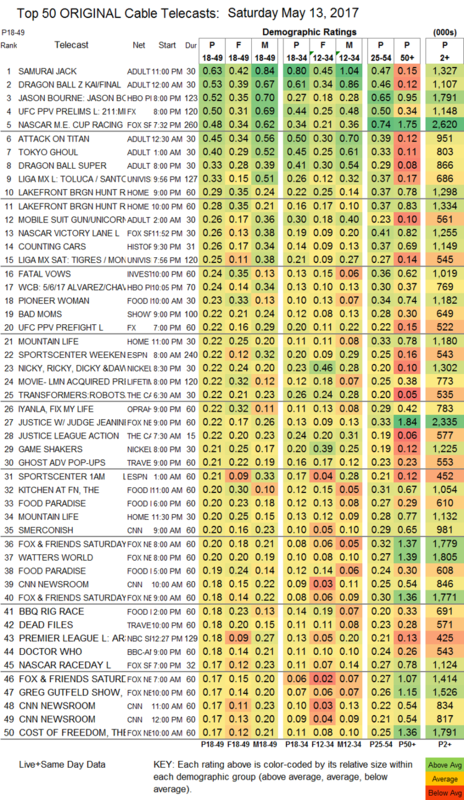 HGTV had a variety of shows on the chart, led by the 9PM LAKEFRONT BARGAIN HUNT at 0.29. History’s COUNTING CARS climbed 0.07 to 0.26. ID’s FATAL VOWS was at 0.24. HBO’s BOXING was at 0.24. On Food Network, PIONEER WOMAN held at 0.23, KITCHEN AT FN fell 0.03 to 0.20, and VALERIE’S HOME COOKING was down 0.05 to 0.13. On OWN, IYANLA FIX MY LIFE edged up 0.02 to 0.22, and THE BOOK OF JOHN GRAY was down 0.04 to 0.11. On BBCAmerica, DOCTOR WHO dropped 0.03 to 0.16, and CLASS ticked down to 0.06. On TLC, SAY YES TO THE DRESS fell 0.06 to 0.16, and NATE & JEREMIAH BY DESIGN was down 0.04 to 0.14. AMC’s newly-renewed THE SON ticked down to 0.14, with the Sundance simulcast adding 0.01/160K.